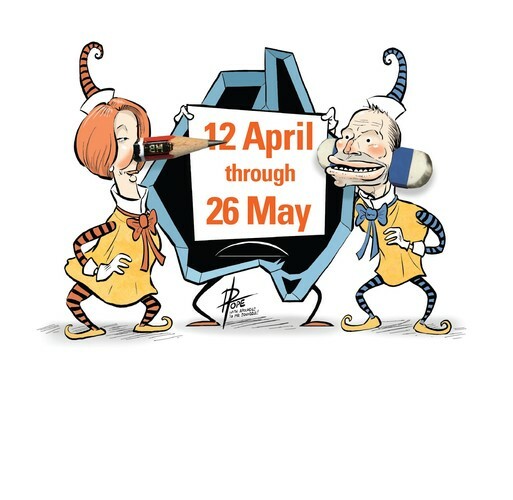 Take a satirical look at the year’s best political highs and lows with a series of cartoons by Australia’s leading cartoonists at Riverside Theatres from Friday 12 April till Sunday 26 May. The annual Behind the Lines exhibition showcases the year’s political cartoons and includes work from the nation's most esteemed cartoonists. The cartoons were chosen from almost 600 submissions and include works from The Museum of Australian Democracy's own collection. Many of the cartoons have appeared in the nation’s top newspapers and Riverside Theatres is exhibiting them all into one, side-splitting and thought-provoking show! The exhibition is in the Riverside’s Theatres foyer and is open to the public free of charge. Pop down for a good smirk and guffaw or plan to arrive early to any of the April and May productions for a look and a laugh. This year the highlight of the exhibition is a series of live one-on-one discussions with politicians and cartoonists. A Poke In The Eye With A Sharp Pencil has a focus on female cartoonists with comedian Wendy Harmer hosting the Opening Night Gala on Friday 12 April and on Friday 26 April she chats with cartoonist Cathy Wilcox. In addition, The Whitlam Institute will host a very special evening of politics, It’s My Party: The Ideas That Fashioned Our Contemporary Parties on Wednesday 1 May at 7pm. Senator The Hon John Faulkner, The Hon Joe Hockey MP and former Leader of the Australian Greens Bob Brown will come together on the one stage to talk about the foundations on which their respective parties have been built. Together they will discuss how these philosophical roots have shaped the Labor, Liberal and Greens parties of today.